What’s your workflow for applying FX to individual samples? General FX apply to the whole bank I think, and Layer FX per pad are very limited. Do you put your sample in a new bank, add FX, re-render the sample, and then add it back into your sample bank?? 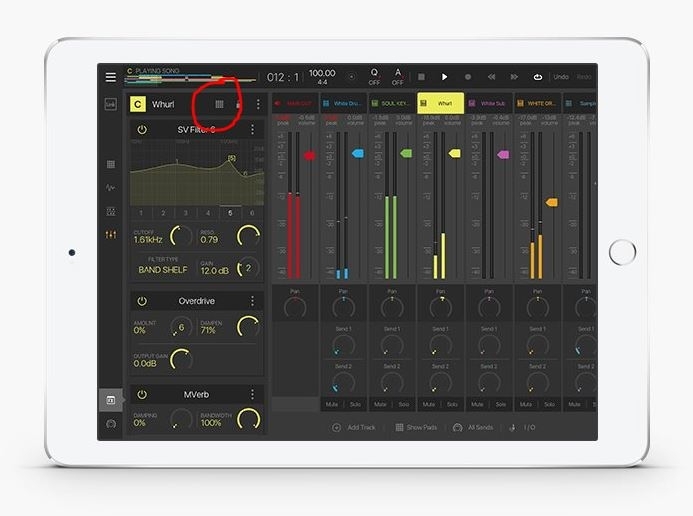 Tap this button (circled above in red) to toggle between the FX chain for the Bank and the one for the currently selected pad. Doing this means you can stack up a load of FX that only affect a single pad. Note - you'll need to switch to bank view first (not song view or mixer view, like above screenshot) so that you can pre-select the pad you want to edit FX for. @tk32 Haha! Damn, I knew it was there somewhere. You just toggle the pad icon. Thank you! I have been focused more on slicing so just getting into applying FX. Still such a noob... thanks guys. With focused making music I just grab ten minutes here, ten minutes there. I really need to carve off some dedicated time and learn the tools. Especially considering there is also the lock to stay on bank output if you so wish.